My name is Martyn Cawthorne and I’m a fully qualified and deeply committed gong practitioner/sound healer and I graduated from the College Of Sound Healing (the full one year training course). I’ve been playing various instruments for over 25 years, and practicing meditation for as long. I live in Trafford, where it meets Chorlton and Whalley Range and offer Gong Spas in various forms all over the Manchester and Cheshire area. Blue Dot, Moovin, Belladrum Tartan Hearts, Lakefest, Carfest North. Yay! What to expect (the practicalities)….. In a one-to-one gong bath we will meet and have a short conversation about your reason for coming (could be anything from ‘just for the experience’ to something much more direct and personal)…..
Click here to see the article about Gong Spa in the Manchester Evening News! Hi there, I’ve just read the article in the M.E.N and I’m really intrigued by this form of meditation/treatment. Can you please let me know what availability you have this week, as I am keen to book an appointment. I am also based in whalley range, just near Withington road shops. I’d like to buy my husband a gong bath for his birthday- do you do vouchers? And would I be able to come too? Do you have any appointments on 1st October for him and possibly both of us? Awesome experience this evening!!! My daughter loved it too as did my friends! Hi I would like to attend your gong bath this Sunday 8th Nov, do you have to book and how much is it? Hi Jennifer. Thanks for getting in touch. The gong bath on Sunday 8th Nov has already sold out, but there is another at the same location (One Yoga, Chorlton, Manchester) on Sunday 22nd Nov. If you’d like to reserve a spot for that one, just email me on supergongspa@gmail.com). Thursday 19th November at Z-arts on Stretford Road in Hulme, Manchester (tickets available from the following link – http://www.z-arts.org/events/gong-bath-z/). If you’d like to be added to the Gong Spa Newsletter, just let me know. I have experienced a Gong Bath before and found it so profound I would dearly like to join you this month….. Have you any places free please…..
Hi Rosie. Lovely to hear from you. I have quite a few slots available so just let me know when you’re free. Do you prefer daytimes or evenings? Thanks Martyn P.S. If you’d prefer, just call/text me on 07850 955810. The one to one Gong Bathe today was beyond my expectations….. I felt so privileged to receive this session. 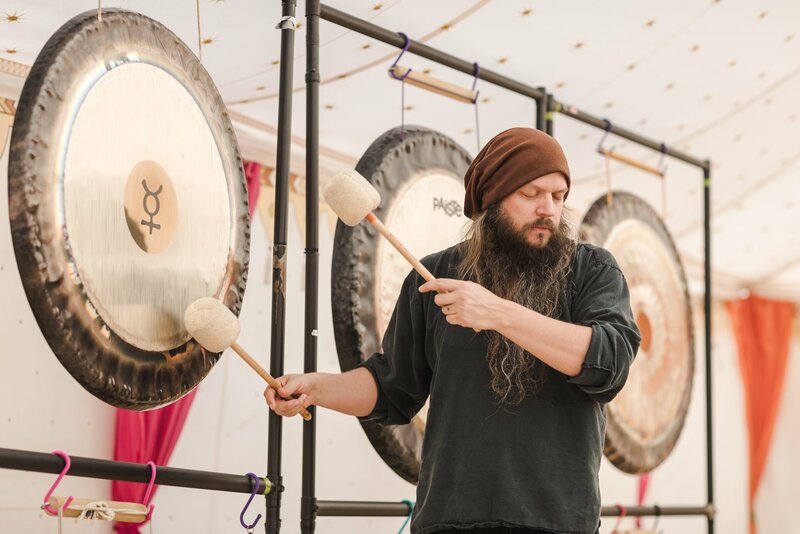 The music you make with the Gong’s is amazing …. I felt as if a deep cleansing was taking place and that I was being programmed with my own sounds…. Two hours later I was listening to Bach’s Air on a G String and for the first time I felt as if I had speakers built inside me and I could feel every note and tone deep within me….. See you on the 22nd Dec for my next Gong Bathe. I picked that day because it’s the Winter Solstice …. Thank you for my retuning ….. I wrote in the Solar Logos forum about the Gong Bathe and already one of the group is asking about the experience ….. The 600 people in the programme are from 23 different counties so it will be exciting when your music is travelling the globe …. Hi martyn, apologies if somebody’s asked this above and I’ve missed it, but I’ve read some things about sound baths having a palliative effect on tinnitus. Is this the case in your experience? Hi Josh. Thanks for writing. Ive heard mixed responses regarding the issue you mention, and am unaware of any official standing. As such, I would recommend that anyone with tinnitus take sensible precautions. Many of the benefits of gong baths are the result of vibrations upon the whole body (not just the ears), so perhaps a good place to start would be to wear high quality ear protection (not just cheap foam ear plugs). A one to one session (as opposed to a group gong bath) could also be a good idea as you could speak to the practitioner in advance, and they should be able to modify the session accordingly. Hi again Josh. Just to add a little to my previous reply….. the mixed responses I’ve had have included some people saying they felt that their tinnitus was soothed during and after the session, and others who have said that they felt it was soothed during the session but not afterwards, and others who’ve said that their tinnitus was not affected. OK, hope that’s of some use Josh. Hi I would like to attend in Chorlton on the 30th? How do I book a place for me and a friend? Hi Liz. Lovely to hear from you. The next gong spa in your area is at Hale Yoga at 7:30pm this Friday (25th August). I’ve been to 3 of Martyn’s Gong Spa’s in Alderley Edge, once a month. I’m the sort of person whose mind never shuts off and is permanently whirring and thinking about work, issues, life and the usual day-to-day rubbish (I work in the legal sector), and I also don’t get to sleep that early. I can say with all honesty that a Gong Spa is the only thing I’ve found that totally switches my mind off completely, when it’s finished I literally have to re-start my brain to get it thinking about things. (music gigs, clubs and other such events occupy my mind briefly, but never switch it off) I also find that instead of feeling tired about midnight, I’m tired at 9:30! If you have a busy, high pressure professional life I can highly recommend this as a way to switch off. If I’m honest I was very sceptical before I went, but I can’t argue with the results … and the people are really really nice to boot. This is now a monthly thing for me! Hi there. I do indeed. Feel free to email me any time on Supergongspa@gmail.com for upcoming training dates and locations. You can also look on http://www.northernschoolofsoundsmiths.co.uk for more generic details of my training events. The next one in holding is a Gongs For Yoga Teachers – Introductory Level in early June. Hi Nicola. Wonderful. Can we discuss further by email? My email is Supergongspa@gmail.com. would you mind dropping me a line there and I’ll get right back to you.